The Chirp object generates a swept-frequency cosine (chirp) signal. Create the dsp.Chirp object and set its properties. chirp = dsp.Chirp returns a chirp signal, chirp, with unity amplitude. chirp = dsp.Chirp(Name,Value) returns a chirp signal, chirp, with each specified property set to the specified value. Specify the frequency sweep type as Swept cosine, Linear, Logarithmic, or Quadratic. This property specifies how the output instantaneous frequency sweep varies over time. Specify the sweep direction as either Unidirectional or Bidirectional. When you set the Type property to Linear, Quadratic, or Logarithmic, this property specifies the initial instantaneous frequency in hertz of the output chirp signal. When you set the Type property to Logarithmic, the value of this property is one less than the actual initial frequency of the sweep. Also, when the sweep is logarithmic, the initial frequency must be less than the target frequency, specified by the TargetFrequency property. 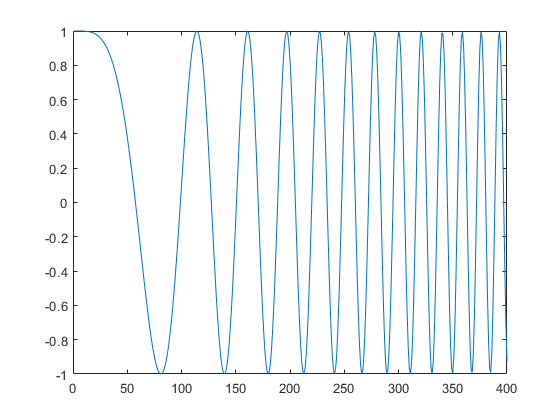 When you set the Type property to Linear, Quadratic, or Logarithmic, this property specifies the instantaneous frequency of the output signal in hertz at the target time. When you set the Type property to Swept Cosine, the target frequency is the instantaneous frequency of the output at half the target time. Also, when the sweep is logarithmic, the target frequency must be greater than the initial frequency, specified by the InitialFrequency property. When you set the Type property to Linear, Quadratic, or Logarithmic, this property specifies the target time in seconds at which the target frequency is reached. When you set the Type property to Swept cosine, this property specifies the time at which the sweep reaches 2ftgt – finit Hz, where ftgt is the TargetFrequency and finit is the InitialFrequency. The target time should not be greater than the sweep time, specified by the SweepTime property. When you set the SweepDirection property to Unidirectional, the sweep time in seconds is the period of the output frequency sweep. When you set the SweepDirection property to Bidirectional, the sweep time is half the period of the output frequency sweep. The sweep time should be no less than the target time, specified by the TargetTime. This property must be a positive numeric scalar. Specify initial phase of the output in radians at time t = 0. Specify the sampling rate of the output in hertz as a positive numeric scalar. Specify the number of samples to buffer into each output as a positive integer. The default value is 1. Specify the output data type as double or single. The default value is double. y = chirp() returns a swept-frequency cosine output, y.
Swept-frequency cosine output, returned as a scalar or a column vector. The length of the output vector equals the value you specify in the SamplesPerFrame property. This object implements the algorithm, inputs, and outputs described on the Chirp block reference page. The object properties correspond to the block parameters.